The unremarkable trend of indie bookstores eschewing Wifi and mobile devices has spread to Wyoming. Forget partying like it's 1999, a Wyoming bookstore wants customers to live like it's 1993: sans personal electronics. Owner Vicki Burger has banned Wi-Fi and electronics in her bookstore, Wind City Books, in an attempt to get customers to actually read books (imagine that! ), reports KTWO-TV. 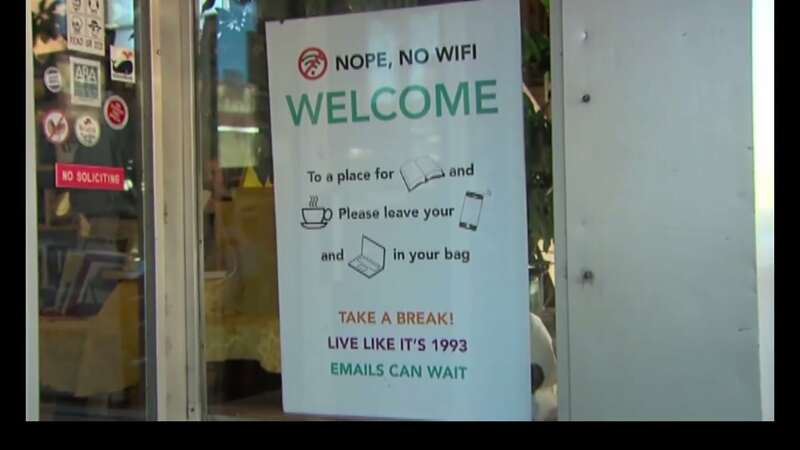 A sign posted on her storefront asks customers to leaver their cell phones and computers in their bags as they enter "a place for books." "Take a break. Live like it's 1993. Emails can wait," the sign reads. According to Burger, customers have wholeheartedly embraced her rules, saying the bookstore is an oasis of peace and quiet. Various sources are reporting that this is a new ban, but UPI makes it sound like this has been going on for a while now. In fact, the ban might actually predate the trend of offering free Wifi in bookstores, which just goes to show that if you resist a fad long enough you can be at the forefront of the counter-movement. Edit: This video no longer plays for me, either. That said, I don't understand the pushback against mobile devices in bookstores. The "bookstores are for books" meme implies that ebooks aren't books, and that there's no positive value in using a smartphone while browsing for paper books. Apparently the ban supporters see no value in browsing Goodreads for reviews, or looking up one's library to make sure one doesn't buy a second, third, or fourth copy of a title (I have done that, actually). I rarely carry a smartphone into a bookstore, but when I do it is more of a tool than a distraction. i have hooked many people in my social circle on the use of the goodreads app in bookstores. specifically, the app allows you to scan the ISBN code on the back of the book and get the immediate rating and reviews of that book. very handy and useful to avoid buying duds based on publisher driven promotion in a store or clever book cover marketing. i get that stores have a right to have whatever rules they want due to private property laws, but this one seems more of a milk-crate stance on tech, rather than providing a specific “oasis” environment within the store. Or possibly this is more to stop would-be buyers using bookstores for discovery, finding books they want, then buying from online retailers at a cheaper price. I have trouble believing that happens a lot. Books just aren’t that expensive for it to be worth the hassle. You are likely correct. But that didn’t mean the bookstore owner doesn’t feel that way. I can understand the ban, even if it is wrong-headed. I can believe it happens, I’ve done it not in bookstores however. I seem to have some arbitrary amount that if it’s x dollars cheaper elsewhere I will buy it elsewhere if I can wait. Sometimes it’s just a competitor’s store (think Lowes vs Home Depot), sometimes online if it saves a bunch of money. i also agree with nate. the hassle is indeed not worth it. Personally, I think that bookstores like that seem to want to appeal to the tech-averse crowd, trying to maintain a “quirky” or whatever feel to their store. I wish them luck. Let’s ban reading glasses too! Just because you open your doors and call yourself a business, it doesn’t mean that you are smart. From the sign, though, it looks like they’re only banning cell phones and laptops, so I guess tablets and eReaders are allowed. Great! When I go into a bookstore I often look for books I think my husband would like. Then I ring him to find out if he has it or would like it. I also keep my bookshop loyalty card number in an app on my mobile. They wouldn’t get my business.